Short sleeve shirts for men are available at execshirts. When you go to add a fabric to your shopping basket you will be asked to make a selection for the "cuff". In this case you would select short sleeves as the cuff option that you want. You can select short sleeves on one dress shirt or you can select them on every shirt that you purchase. 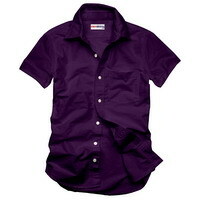 All of the other custom options are available to you with regards to your short sleeve shirts. We make shirts in short sleeves using traditional fabrics or you can have a linen shirt or silk shirt cut with short sleeves as a more casual shirt. Whether you want to wear your short sleeve shirt in a casual or formal setting is up to you, but any of our fabrics can be used to make short sleeve dress shirts for men.